iOS users who long for 1979, it’s time to rejoice. 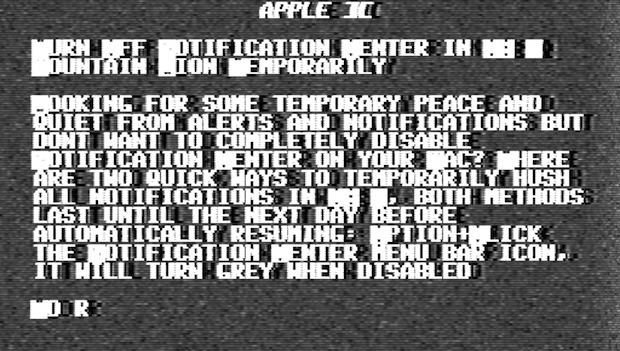 Just like you can run an Apple II simulator in Mac OS X, you can now run that same piece of computing history right on your iPad, iPod touch, or iPhone. It’s all part of the free XScreenSaver package for iOS, which includes a huge bundle of old school screen savers in addition to the aforementioned Apple II simulator. Launch XScreenSaver and look for “Apple2”, tap the little blue arrow to customize the color, noise, tint, and behavior of the app. Unlike the Mac version you can’t interact with it as a terminal emulator, but you can give it an RSS feed or text file to type out for you. The screenshot up top shows the OSXDaily feed being read by the simulator. There are plenty of other classic screen savers from yesteryear that function as little shows in the app, like BSOD, BouncingCow, Matrix, and Flying Toasters. The entire XScreenSaver package is also available for Mac users as a free download, in OS X it can actually be used as a screen saver too. Just can’t help but wonder why, but I downloaded it anyway. LOL. Do you know how to get xscreensaver to actually run? I dL’ed it but it doesn’t run (I have never installed a screensaver on a phone before). I’ve used XSS on Linux in a number of configurations and it works beautifully.